WHAT IS IT? What most racers new to the sport don’t know is that Pro Circuit’s Mitch Payton was the number-one desert racer back in the 1970s, that he raced Husqvarnas, owned a Husqvarna dealership and sponsored an incredibly powerful Husqvarna race team that included Andy Jefferson, David Gerig, Tommy Croft, Troy Lee and Jeff Jennings. Even though Mitch would go on to lead Team Peak Honda, SplitFire Kawasaki and Monster Energy Kawasaki to over 200 AMA Pro wins, he has a soft spot for Husqvarna, which led the MXA wrecking crew to test Pro Circuit’s Ti-6 exhaust for the 2019 Husqvarna FC350. It is available as the Ti-6 (a full titanium system with a Ti canister and carbon end cap) or as the $226 cheaper T6 system (a stainless system with an aluminum canister and stainless end cap). The Ti-6 and T-6 have the same dimensions and identical performance, but the Ti 6 weighs less. 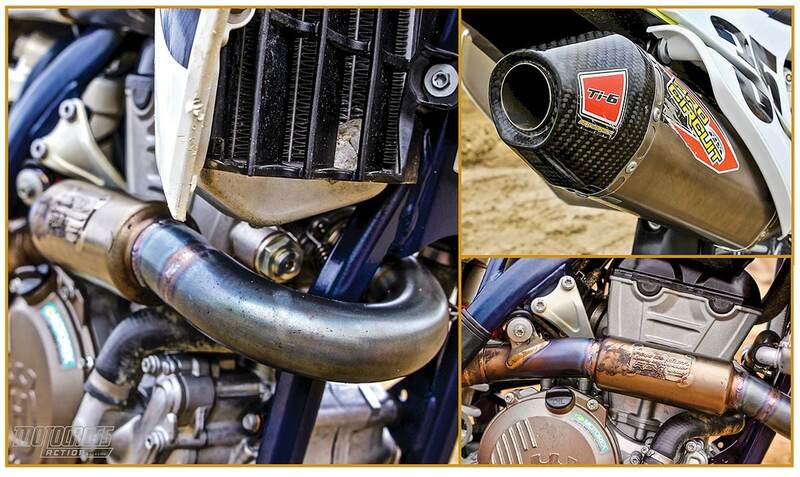 Additionally, the Pro Circuit Husqvarna exhaust also fits the KTM 350SXF. WHAT’S IT COST? $999.95 (titanium/Ti canister/carbon fiber end cap), $779.95 (stainless steel/aluminum canister/stainless end cap). WHAT STANDS OUT? 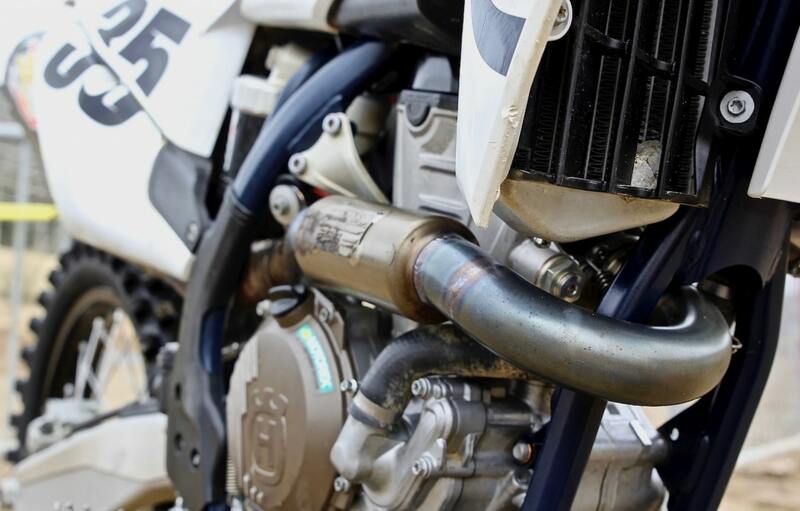 Here’s a list of things that stand out with the Pro Circuit exhaust system for the 2019 Husqvarna FC350. (2) Pro Circuit power. The Pro Circuit exhaust system did not—we repeat, did not—change the high-rpm FC350 engine into a midrange monster. That would be foolish. Instead, it pumped up the existing FC350 powerband without changing the curve. The Pro Circuit Ti-6 produced 55.03 horses at 11,000 rpm with 29.41 foot-pounds of torque. We’ll do the math for you. At peak, the Pro Circuit pipe makes 2 more horses than the stock pipe and 0.75 pound-feet of more torque. And that’s not the half of it; it is 3 horses better at 11,000 rpm and 2 horses stronger everywhere above 9000 rpm. 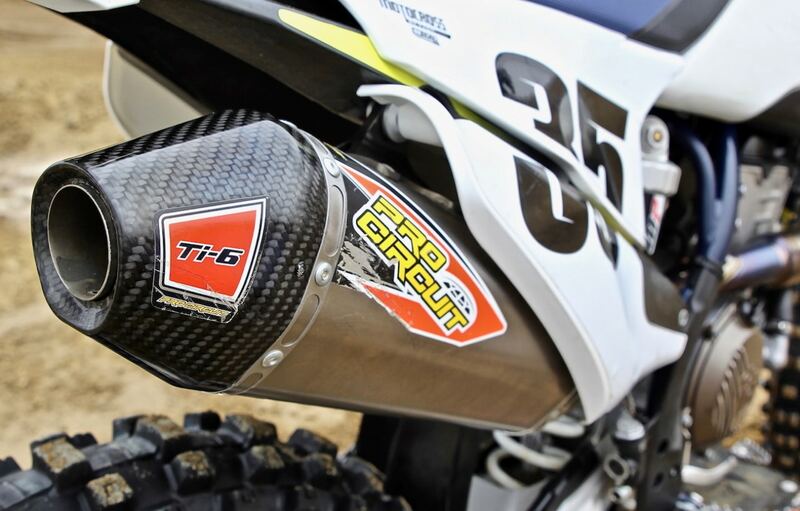 Paradoxically, the Ti-6’s 55.03 horsepower number makes the FC350 as powerful as a 2019 Suzuki RM-Z450 at peak. (3) Track testing. On the track, MXA test riders reported that with the Pro Circuit pipe they could get out of corners quicker, up hills faster and were able to clear big jumps with less run. Best of all, it had the exact same powerband as the stock FC350, just with more power. WHAT’S THE SQUAWK? No major complaints, but be sure to coat the slip-fit at the mid-pipe with anti-slip compound to help them come apart after the first use. 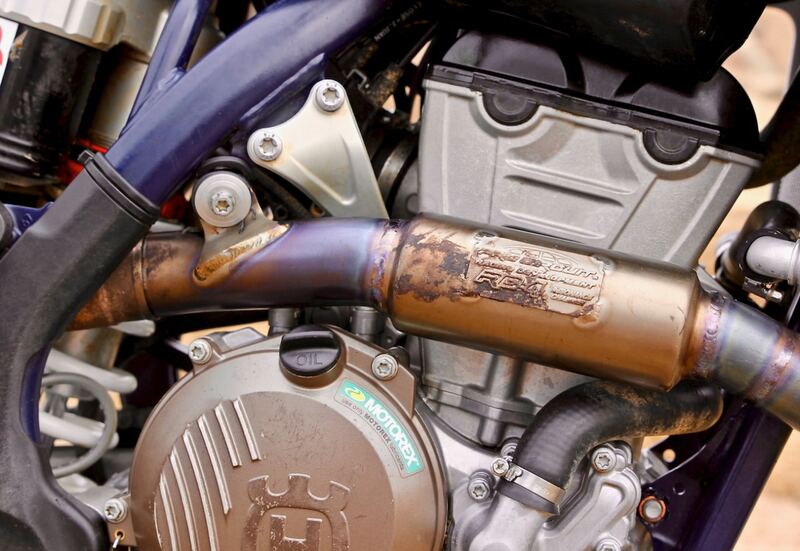 MXA RATING: This a great exhaust system. Not only does it make more power, it delivers the same character as the stock engine. If it were us, we’d buy the $779.95 stainless system, because it makes identical horsepower and is less prone to rock dings in the head pipe. And, did we mention that it is over $200 cheaper?